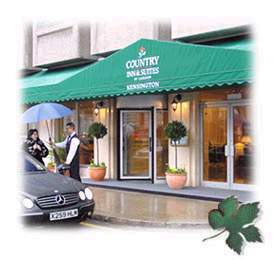 Country Inn & Suites by Carlson®-London-Kensington, opening mid-January 2002, is one of very few new central London hotels in Kensington - a very sought after location for London hotels. Country Inn & Suites by Carlson London-Kensington will be leading an exciting brand in the UK, which is a sister of world renowned Radisson and Regent International Hotels. Beautifully renovated, this is one of few London hotels where you are our guest and not just a room number, where you will be impressed by those extra touches to make you feel at home. The modern purpose built hotel enjoys a superb location close to London’s main museums as well as Hyde Park and Marble Arch. It is just a short distance from High Street Kensington and Knightsbridge. Theatres and London’s sights and further shopping are a short ride away on a direct line from Gloucester Road underground station or on one of many bus routes, whilst the immediate area buzzes with many restaurants and a lively nightlife. Earls Court and Olympia exhibition centres are both close by.